Park Seu-mi, a mother of two sons, once suffered from a crippling lack of self-esteem. The extra weight she had gained from having kids never melted away. The busy mom battling two children at home had no time to spare for going to a gym. The frustration drove Park to make an exercise routine on her own, focusing on moves that could be easily done inside the house. Besides the time she has saved, Park said there is another advantage of exercising alone. “The best part of the at-home workout is that you don’t have to care about what others at a gym think of your appearance,” Park said. Park said that beginners can easily get distracted by counterproductive thoughts, such as, “Everyone would stare if someone fat like me were exercising at the gym.” At home, however, people can keep their own pace in working out free of such worries. To help others undergoing similar struggles, Park filmed her exercise routines and started to share them on YouTube in 2015. Over 190 video clips of Park have attracted more than 90,000 subscribers, making Park one of the top YouTube instructors in Korea. “Home training,” or “at-home workouts,” is nothing new in the country’s self-driven exercise market. Before Park, there was a supermodel named Lee So-ra who created a sensation of home exercise in the early 2000s. The series of workout videos she released proved a megahit at the time, and the clips still circulate the internet. The trend, however, has become even stronger and wider among local fitness enthusiasts since the wide adoption of social media, especially YouTube and Instagram. Nearly 200 channels come up when searching for “home training” on YouTube, while Instagram has more than 376,000 posts with the hashtag. Targeting those who want a fit and strong body, YouTube videos focus on burning calories and building muscle at home efficiently. The instructors demonstrate exercise routines step by step, encouraging viewers all the way. As different people can have different goals, many videos feature different routines. Some focus mainly on cardiovascular exercise, building strength, or just simple stretches after a long day. Most programs do not require any additional equipment. When necessary, instructors utilize a water bottle as a dumbbell or chair for stepping. While YouTube videos show how to exercise at home alone, Instagram links stay-at-home fitness addicts, preventing a feeling of solitude during the workout. Social media users share their workout logs and ask for feedback from instructors. Gurus regularly carry out Instagram Live sessions to answer questions, or broadcast workouts to exercise together with followers. Along with social media platforms, mobile fitness applications are gaining popularity among those trying to stay fit. 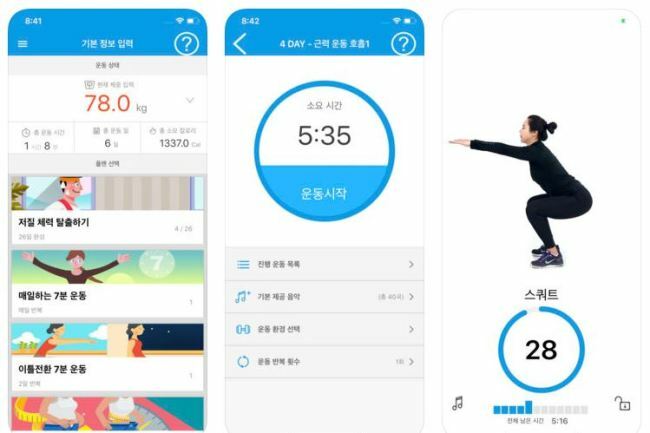 The free mobile application “Fit Day,” for instance, offers various workout programs including “Everyday 7-minute Exercise” or “Intense Abs Workout Routine.” Mobile devices connected to the applications, such as the Apple Watch or Fitbit, automatically calculate calories burned and log it into the app. “I knew nothing about weight training, but the application taught me how to strengthen my muscles. I have been exercising with the application at least three times a week,” a user wrote in a review. There are currently more than 250 mobile fitness applications that can be downloaded from the Google Play app store. The at-home workout trend has been sweeping bookstores as well. More than 25 books have been released with the “home training” keyword in the title since 2016. Most of the related books introduce exercise steps and movements with pictures and detailed descriptions. “Juwon Home Training” and “Seumi Home Training,” two of the most popular training books here, have sold over 30,000 and 13,000 copies, respectively, so far. Experts, however, stress that beginners and buffs alike should take safety precautions when they work alone at home. “To prevent muscle strain and injury, all should do gentle, static stretches to warm up their bodies first,” said Jo Ha-na, a professional trainer at Star Kali Fitness gym in Seoul. As an incorrect form or posture during a workout can also trigger severe pain, Jo recommended people film their exercise routines and compare them to the experts. Before starting muscle-training routines, beginners should consult a doctor, instructor or expert if they have a precondition or medical issues. Also, it’s important not to lift too heavy or overdo it from the beginning, according to Jo. Park Seu-mi, who is now working as a professional home training instructor, has another point for beginners to remember to get results.